I don’t just love food, I even love things that only look like food too. Which is why I knew even though it was somewhat unnecessary, a little ridiculous, and totally an impulse buy, that I just had to own the cookie look-a-like coin purse that I saw at the MoMA bookstore and giftshop. Food-shaped accessories, a win-win situation. The MoMA store is awesome, filled with enough artsy gadgets and gizmos to keep me entertained for hours. Even though I’d been there often, I’d never seen these: a line of coin purses and pencil pouches (I’m assuming that’s what they were) shaped like food items. 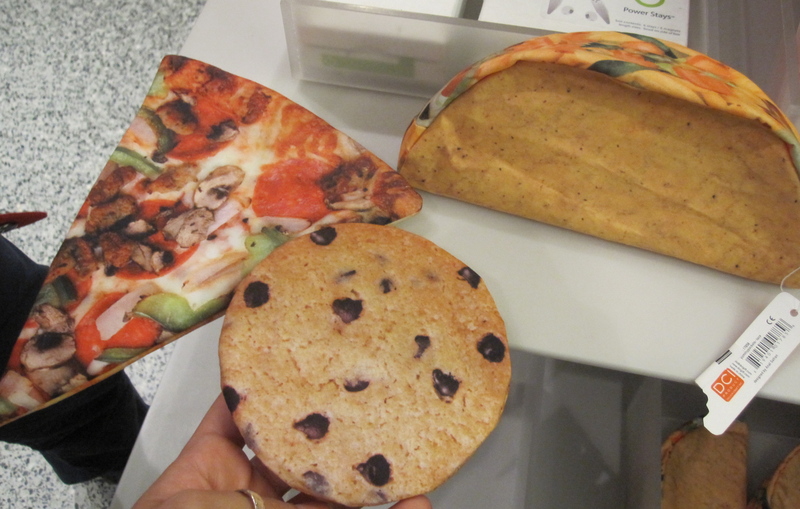 There was a slice of pizza, a taco and a chocolate chip cookie, each one hilariously real looking. I debated back and forth on whether I really needed it, but in the end lost the fight. C’mon, who was I kidding? When have I ever been able to say no to a chocolate chip cookie? This entry was posted in Uncategorized and tagged coin purse, cookie, MoMA, pizza, taco. Bookmark the permalink. what in the heck? I have never seen these, but now that I have I realize that I need them all.